As we conclude 2011, another year of rich activity, including the first meeting of the Hermes Forum on Mysticism and the Spiritual Life, (see the April edition), we are proud to share with you the good news of Elijah’s work having taken another step forward. As reported in the following news item, Elijah has extended its repertoire of techniques for the Educational Network with our foray into Bibliodrama, with European partners. At the same time, we are developing our website to become a leading educational platform, planning our forthcoming meeting of the Elijah Board of World Religious Leaders and participating in multiple events internationally. However, all this activity also brings to mind the biggest challenge that we continue to face – financial support. Most of our programs are conducted on Elijah’s slim operating budget. If we are to continue in our pioneering work, we require partners, with whose help this work can be advanced. As the year draws to a close, we ask you to remember Elijah as part of your end of year giving. The Elijah Educational Network has added Bibliodrama to its repertoire of techniques for interreligious dialogue. 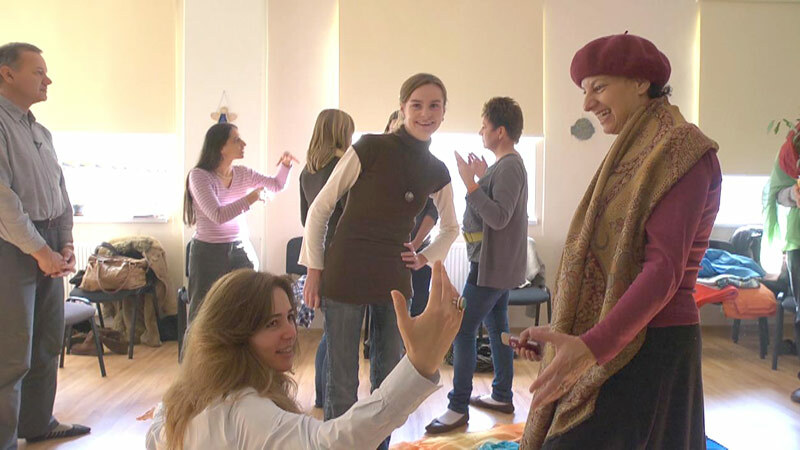 Elijah has now conducted three Bibliodrama workshops in Jerusalem, held under the skilful leadership of Yael Unterman where Christians, Muslims and Jews have explored stories from various traditions using this unique methodology. The workshops are part of an international project to explore the effectiveness of Bibliodrama as a tool for interreligious dialogue, funded by the European Union. For the first meeting, we decided to use a culturally/ religiously neutral text, to introduce the method and avoid some of the sensitivities that can arise when we tackle sacred texts. 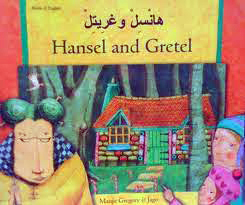 Hansel and Gretel is well-known to all who have grown up in a European context. There are Hebrew (Ami and Tami) and Arabic versions, too. It is a story with characters who (potentially) can be interpreted in various ways and who undergo various tests, it has a sinister overtone, raising questions about the existence of and response to ‘evil’, and it has an ending of the victory of virtue or ‘happily ever after’, which is in itself worthy of analysis. In other words, it has many of the elements we might find in a sacred text without the claim of ‘truth’ or even ‘morality’. Yael skillfully took the group through the experience of responding in the voices of the various characters, (including even the gingerbread house), of creating dioramas with empty chairs representing characters, of hypothesizing about what might have been and finally, of putting God into the picture. Participants were totally engaged in the process and even those who were quiet at the outset seemed to get into the mindset. The success of the process is testified to by the fact that we ran out of time to do very much training or analysis. What we succeeded in achieving was enthusiasm for the process and drawing out people so that they were not self-conscious in each other’s company. This has been built upon in subsequent sessions exploring the sacred stories of Christians, Muslims and Jews. Combining a close reading of biblical, actually any scriptural, text with searching, imaginative questions, Bibliodrama offers people of all ages and levels of knowledge an opportunity to experience of a method of creative study that, in the past twenty five years, has changed the way we read the Bible. You can read more about it here. 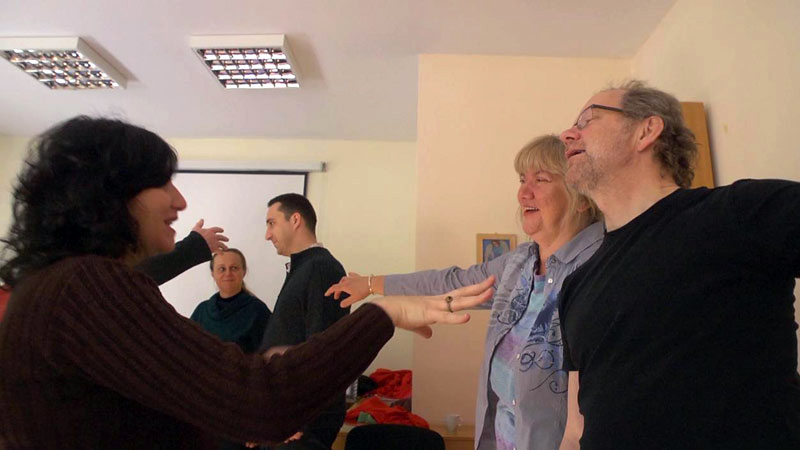 The Elijah Interfaith Institute is a joint recipient of a prestigious Grundtvig Grant from the European Union, to test the technique of Bibliodrama as a tool for Interreligious and Intercultural dialogue. Other partners in this international project come from Poland, Iceland, Hungary and Turkey. Grundtvig Multilateral Projects are undertaken by institutions or organisations from different European countries working together, pooling knowledge and experience, in order to achieve concrete and innovative results or products ‘with indisputable European values’. Elijah’s involvement in this project exploring a new technique for intercultural and interreligious dialogue, underscores the unique contribution Elijah can make as an international organisation based in Israel. Yael and Elijah’s Director of Educational Activities, Peta Jones Pellach, travelled to Poland to meet the other partners in the project and to participate in a training seminar. The group is diverse not just in national and religious backgrounds but also in the range of professions represented. The preparatory meeting allowed for an intense exchange of ideas, highlighting the different approaches each team will take as well as establishing a common basis for moving forward. The project requires Elijah to conduct 60 hours of Bibliodrama workshops in Israel over two years and to compare the outcomes for participants with outcomes in the other participating countries. Towards the end of the project period, Elijah will be the key organizing agency of a conference comparing various methodologies for successful interreligious dialogue in Krakow, Poland. When Elijah was presented with the challenge of recruiting participants for the Bibliodrama project in Israel, we identified three problems: language, geography and motivation. Finding a common language, in a very literal sense, amongst Israelis and Palestinians is not easy. English is the least culturally biased but it means that only a highly educated group can participate. Our dialogue group is based in Jerusalem and in order to reach Palestinians as well as Israeli Arabs, we want to draw on residents of surrounding towns such as Bethlehem. There are many logistic difficulties, including the fact that residents of towns that are under the Palestinian Authority need permits to come into Israel proper. There are many interfaith and intercultural dialogue groups already in existence – what would draw people to this particular project if they have not already been attracted to the various dialogue opportunities? 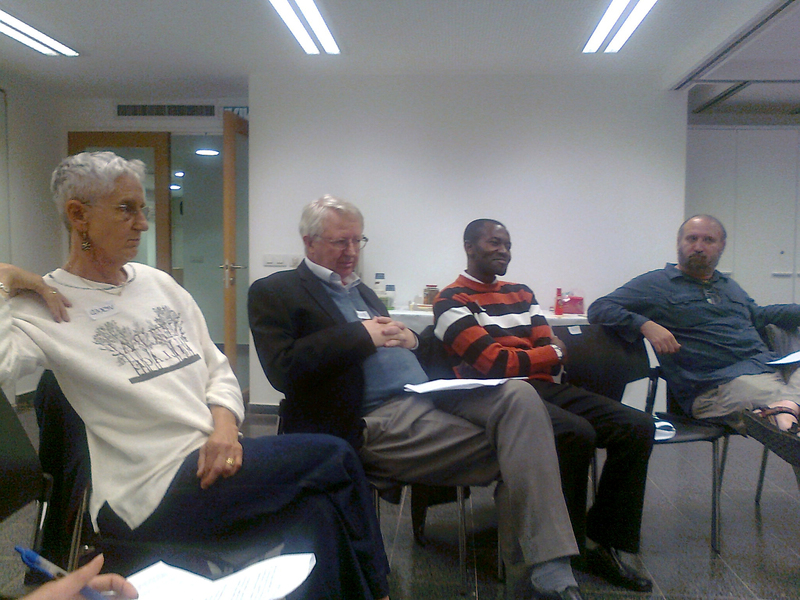 In order to overcome all of these difficulties, we chose to work with the Interfaith Encounter Association, which boasts a cadre of local branch leaders who have the language skills, the willingness to go through the routine of acquiring passes, if required, and travelling to meetings, and who are looking for new skills that they can bring back to their various groups. Because Interfaith Encounters has few Christian members, we extended the invitation to the Rainbow Group, a Christian-Jewish dialogue group that focuses on sharing theological insights. In other words, this is not a group of ‘ordinary’ Israelis and Palestinians but a group that is highly motivated to pursue successful dialogue and already has some of the tools to do so. Our rationale in working with this elite group is to train them in the art of Bibliodrama so that it will become a tool in their work as dialogue leaders and teachers. The workshops comprise the practice of Bibliodrama and training in the method, based on directed reflection on what they have experienced. It is expected that the people we train will take the methodology to a much broader public. 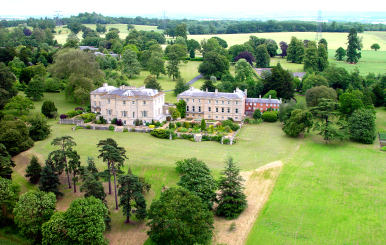 The next meeting of the Elijah Board of World Religious Leaders will be held in March at the Brahma Kumaris’ Retreat Centre just outside Oxford in the UK, on the topic of Interreligious Friendship and we are interested in knowing how such friendships develop, what the barriers to them might be or what difficulties might be experienced in them, and what the impact is on people involved in such friendships. If you would like to add your story of an interreligious friendship to our database of personal stories on our website, please send it to this e-mail. 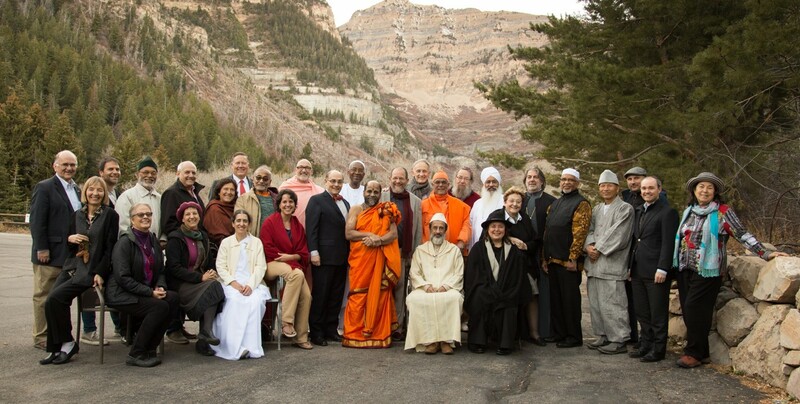 Some of the stories will be used as case-studies at the meeting of the Elijah Board of World Religious Leaders and may form part of the publications for or following the meeting. 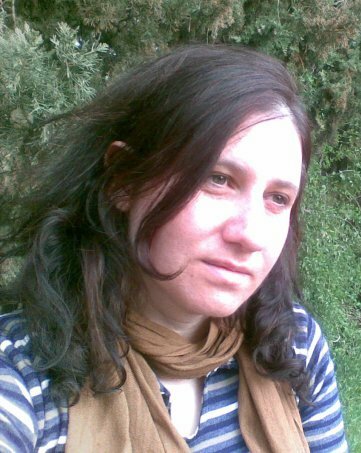 Yael Unterman is a creative educator, writer, performer and life coach, who grew up in the UK and now lives in Jerusalem. She has facilitated Bibliodramas with diverse Jewish groups in Israel, Europe, UK, US, Canada, and Australia; and now is venturing for the first time into interfaith Bibliodrama. For more and to listen: www.yaelunterman.com/bibliodrama. [Nehama] Leibowitz believed in offering a diversity of interpretation, and the method she invented of presenting different commentaries side-by-side was very much a facilitator’s technique. It activated the students, and also taught them that many options existed, and that their questions were not heretical; as Leibowitz states: “It is important to include this opinion too so that the students will not assume that Rashi’s explanation is the only one possible, and anyone who is bothered by it… is, so to speak, an utter heretic who has no part in the Torah of Moses.” … However, Leibowitz took the facilitator role only so far before putting on the pedagogue’s hat. The students were allowed to choose, but only from a certain range of sources selected by her. On a final, personal note, as a product of an Ultra-Orthodox high school and some elite Modern Orthodox institutions of higher learning, I personally suffered greatly from the cramped limits of Orthodox classrooms. There was little space available for my questions and for self-expression. My opinions were at best tolerated, rather than engaged or valued, and at worst seen as threatening, though they stemmed from an entirely genuine searching place. As for my creativity and imagination, it found no place at all. Many of the lessons strait-jacketed and silenced me rather than allowing me to emerge feeling more engaged, more connected and more self-appreciating.